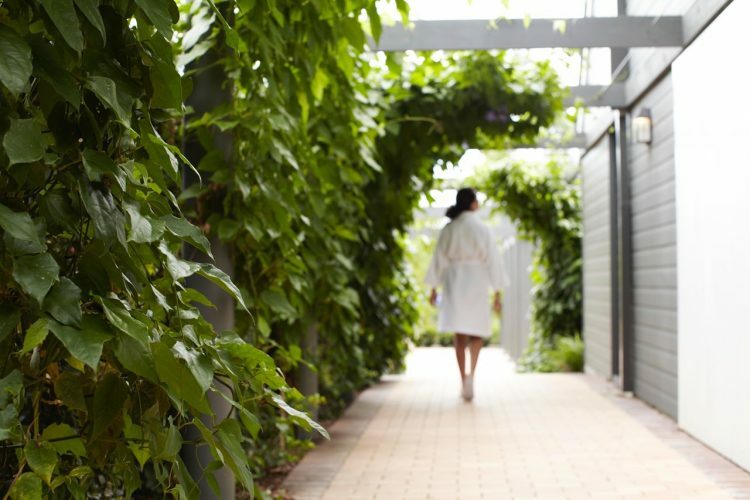 Stepping into the exclusive Bambini Trust building, you know you’re about to have a luxurious experience. And Amy Jean’s diminutive salon doesn’t disappoint. 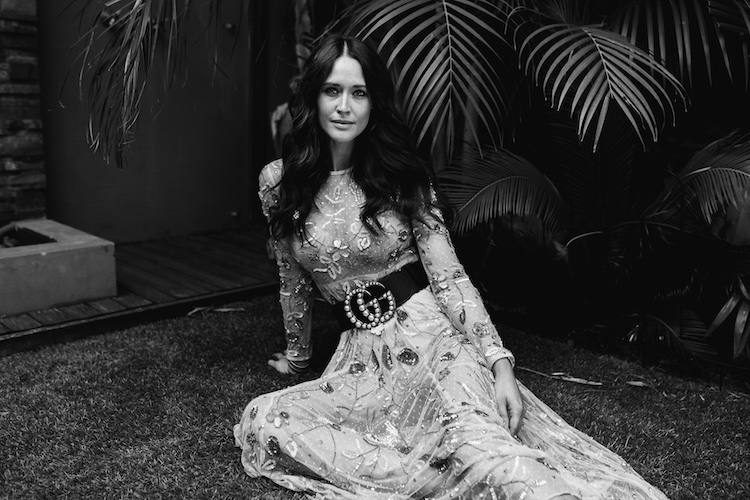 Regarded as the “Arch Angel” to Australia’s A-List, AJ has built a reputation as being the best at her business – and that is the business of “dressing the eyes”. 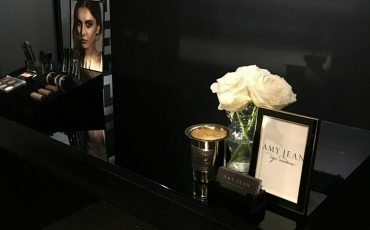 Just as a couturier creates bespoke garments for his clientele, Amy Jean analyses her clients face and creates stunning lashes and brows that perfectly frame the eyes – which she has done for everyone from Dannii Minogue to Delta Goodrem. 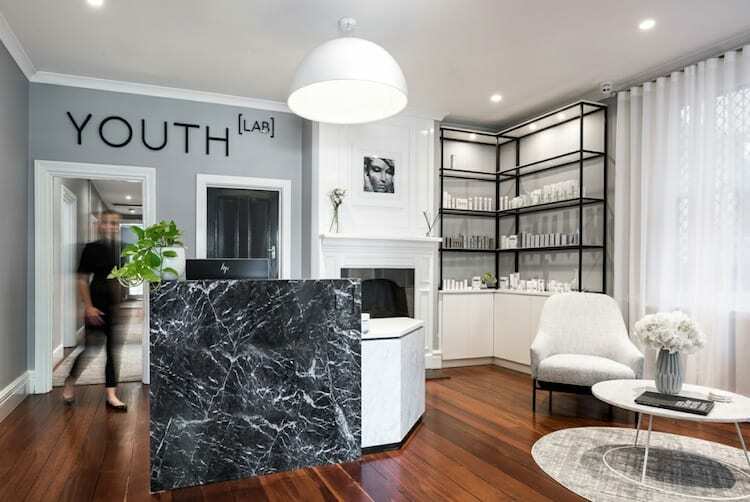 She currently has four salons in Sydney, Melbourne, The Gold Coast and Brisbane and is so in demand she has done pop up salons in Perth and Paris. “I believe eyes are windows to the soul,” says Amy Jean passionately. 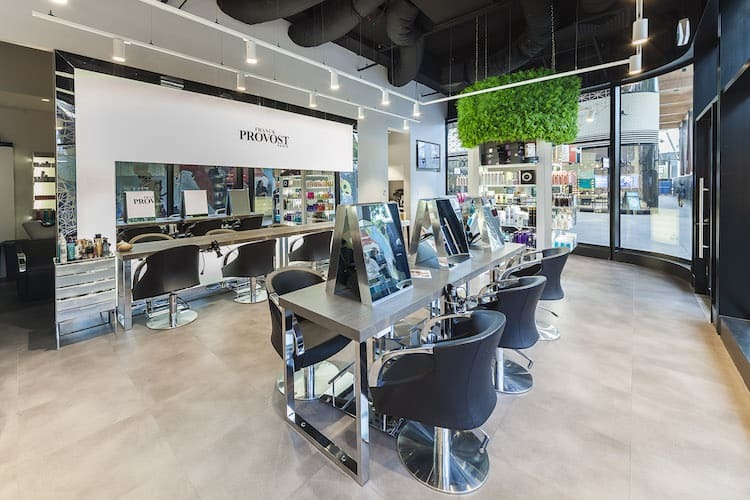 “I love to create and I’ve always been a keen artist.” Although it can take months to secure an appointment with the eye stylist herself, AJ has trained her staff in her particularly precise technique and she closely coaches them to maintain a top level of service. However it’s Amy Jean’s service I’m lucky enough to experience today. As I step into the chic dark-walled space of the reception, I take in the sparkling chandelier and a shiny gold plaque above the desk announcing “Amy Jean Eye Couture”. 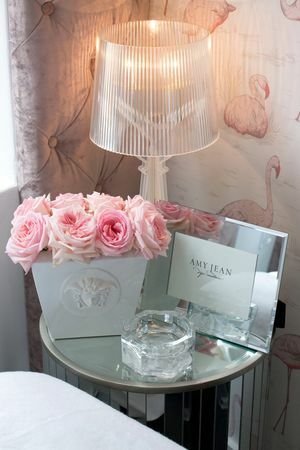 There’s soft lighting and a vase laden with fresh red roses. 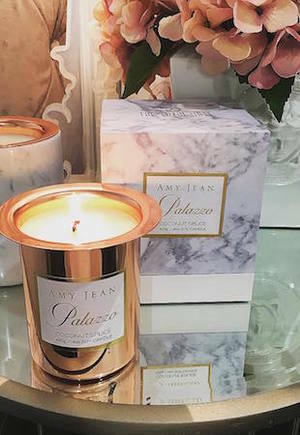 The waiting room is filled with the mouthwatering caramel scent emanating from Amy Jean’s very own branded candle. There are fashion-focused coffee table books for me to flick through and a range of AJ’s preferred products at eye height for play and purchase – including Dr Spiller skincare, Priori Lash Recovery Serum and her own range of Eye Couture products. I’m a big fan of the Eyebrow Putty and I can’t resist stroking the silky soft makeup brushes that are on display. 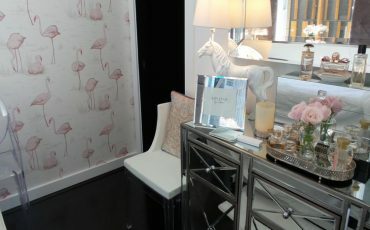 Above the register a top shelf is lined with bottles of Bollinger – a clue to Amy Jean’s bubbly personality. I don’t have to wait long as the brow queen herself sweeps in wearing a black bodycon dress and towering YSL Tribute heels. Her platinum hair frames an immaculately made up face with wide lash-lined eyes. There’s no mistaking it, she’s a walking advertisement for her business. 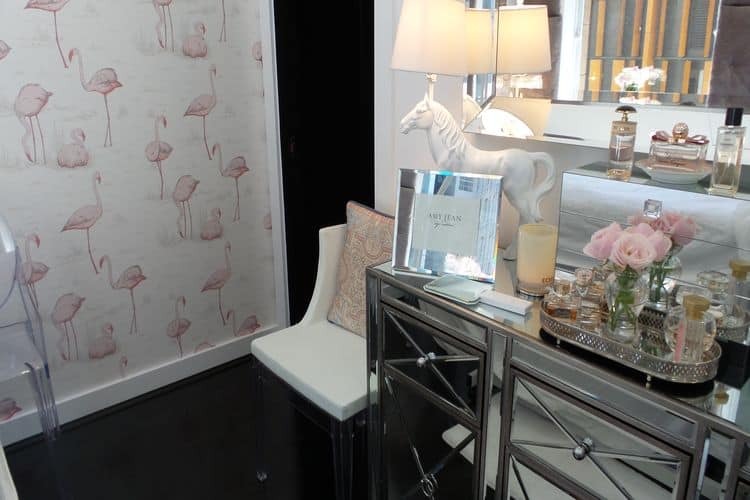 We step into her white, light-filled treatment room where the walls are papered with pink flamingos and there are white roses spilling out of a vase in the corner. I settle back into the treatment bed, ready for my brow shape and lash lift (which involves perming the lash so it stands up by itself and tinting it – negating the need for mascara). AJ is also an expert in Feathertouch – a form of brow tattooing for sparse or patchy brows – sadly I can’t try this as I’m pregnant, but I make a note to do it as soon as I’m able to. The next hour goes by in a flash as we gossip and catch up on life, before AJ presents me with a hand mirror to admire her handiwork. I’m stunned. 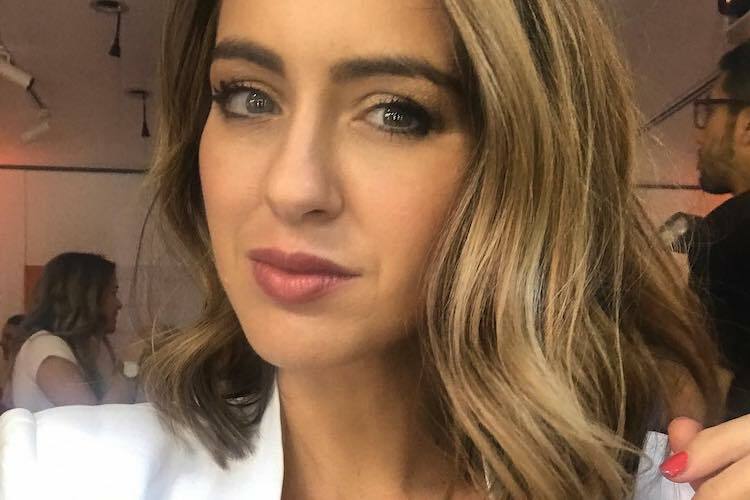 My straggly brows have been replaced by sharp, defined arches and my lashes, which were looking stubby and sad after months of extension-abuse, are tinted and curled – which apparently lasts for eight weeks. Every service is finished with a makeup touch up using her own range of Amy Jean Eye Couture cosmetics, so I’m able to face the world without any telltale waxing redness. I only wonder why I didn’t get my eyes styled sooner.